Home Menu Course Appetizer PROSCIUTTO ROSEBUDS; the cutest appetizers ever! I’ve always loved bacon-wrapped dates but they are really high in sugar. In fact, dates are sugar (look up “date sugar” if you don’t believe it). When I was making the candied fruit for my Christmas fruitcake, I had an inspiration. Kumquats are like little oranges except that oranges have sweet pulp and bitter peel; kumquats have thin, sweet peel and the pulp is bitter (and seedy). I use them in recipes that call for orange zest because it is easy to remove the insides so you have just the peel or zest without the bitter white pith. As a bonus, when you pull out the pulp, it leaves a perfect shell for stuffing. I candied them so they are as sweet as dates or dried figs, but without all the sugary carbs. 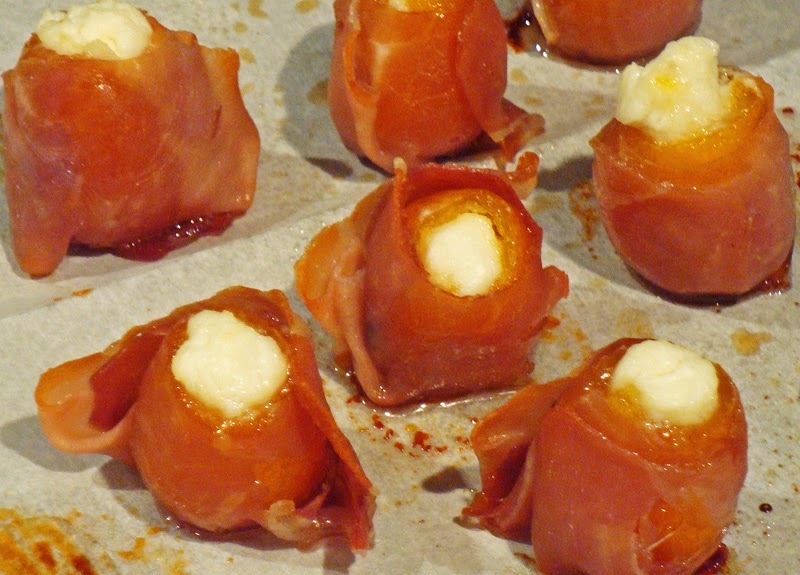 I made some of these with thin-sliced bacon for Christmas Eve, but the prosciutto works better. They make a perfect nibble for a special occasion! By the way, I did get the fruitcake that my husband wanted made in time for him to enjoy on Christmas, but not soon enough to post the recipe and photo for you. It turned out great, but I doubt that anyone will be interested in trying it until next year. Let me know if I’m wrong. Prepare a piece of waxed paper or parchment to drain fruit. Line a sheet pan with parchment. Preheat oven to 400 degrees. Cut off a thin slice from the small end of each kumquat. Cut an “X” into the pulp with a sharp knife but don’t pierce the skin. Set pan over medium-low heat and bring to a simmer. Cook until liquid thickens to form a syrup. Add kumquats and simmer, stirring occasionally, until the syrup is thick and the kumquats darken and become translucent. It may take about 30 minutes, but time may vary, so go by how the kumquats look–they should look candied. Add more water if necessary. Turn off heat. Dip kumquats out with a slotted spoon or sieve and let excess syrup drain back into pan. Spread in a single layer on waxed paper or parchment and let stand to cool and dry out for a few minutes. Cut a slit in one side of each kumquat (kitchen scissors are handy for this) and pull out inner pulp and seeds. Stuff each kumquat with about one teaspoon (1/4 ounce) of cheese and press back into shape. Open the package of prosciutto. Each thin slice will be separated with a layer of plastic or paper. You will need about 1/2 slice of prosciutto per kumquat. It is easier to cut through the whole stack of slices, including the separating sheets, at once with kitchen scissors. Lay a kumquat on one side of top slice and peel edge of prosciutto slice from sheet. Roll up to enclose kumquat, leaving open end with cheese exposed. Wrap excess prosciutto at the bottom up and around kumquat to make a rose. Set on baking sheet with open end facing up, as in picture. Repeat until all are wrapped. Bake in preheated oven for 8 to 10 minutes or until prosciutto is crisp. Serve on wooden picks if desired. May be served hot or at room temperature. ** I used EZ-Sweetz brand erythritol with sucralose to test recipe–EZ-Sweetz also comes as a stevia blend. There are many brands that are mixtures of erythritol plus a high-intensity sweetener, including Sweet Perfection and Swerve, which would probably work as well. Tips: I poured the leftover syrup from cooking the kumquats over hot, buttered popcorn to make caramel corn! You could also stir some nuts into the pan until coated and spoon them out like pralines. Nutrition data per each of 16. I would like the fruitcake recipe ASAP if you don't mind??. Looks really good! I didn't see when to add the water?? guessing it's at the beginning in the saucepan with sweeteners? I love fruitcake and would make it throughout the year if I had a lower carb recipe. I would appreciate it if you would share the recipe. Thanks for finding my mistake, Anonymous! Fixed it. Looks like I need to get the fruitcake recipe up after all! Well it is still officially the "holidays" for 2 more days.